The next unit on short vowel sounds will cover the short e sound. This is the sound you hear in words like red, jet, and egg. 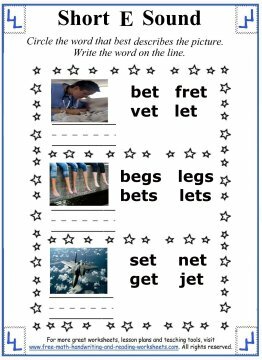 You may find it helpful to print out the list of short vowel words (link at the bottom of this page) to give your child a quick glance at many of the words that short 'e' can form. You can spend time going over the list, slowly pronouncing the words with your child and really focusing on the 'eh' sound. If you have already completed the previous short vowel lesson for 'a', then most of the worksheets here will look familiar. 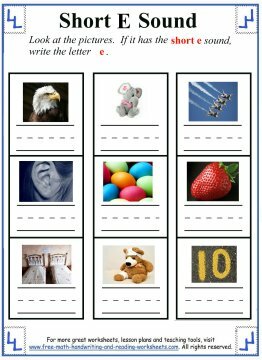 The Web Words task will ask your child to write ten words that use the short 'e' vowel sound. On the paper, you will see a spider hanging on a web. The web is divided into ten sections. 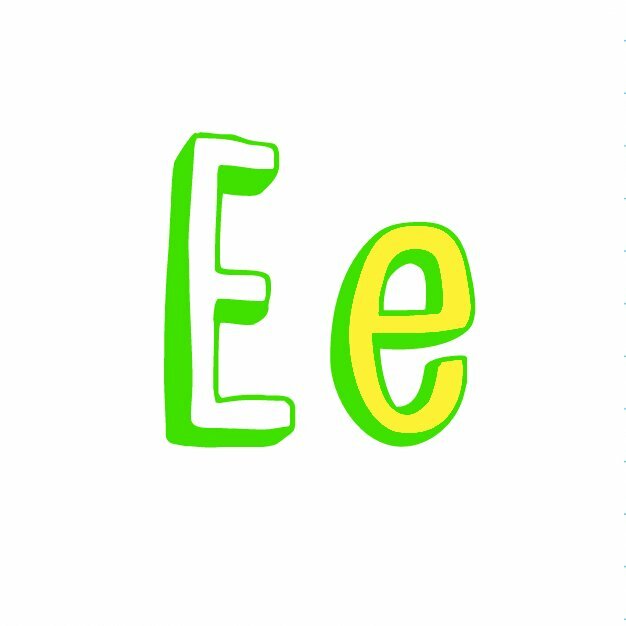 Have your child write a word that uses the short vowel sound for 'e' on each section of the web. For older students, you can make a game out of this. 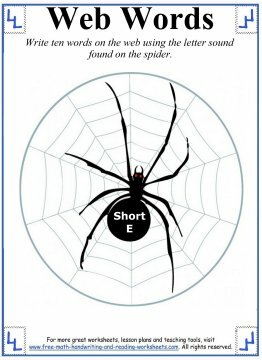 Instead of limiting them to ten words, have them write the words on the blank space between the webs. That gives you more room to write more words. Challenge your child to come up with as many as possible! Next is a rhyming and sentence writing activity. Each box contains a word that rhymes with one of the short 'e' words in the word bank at the top of the page. Write the correct word in each box. Below that there are two lines for a writing activity. In the first sentence, your child will need to use a word from the word bank to fill in the missing word. On the second line, have your child create an original sentence using one of the other short e words. 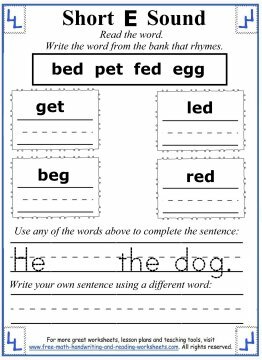 If needed, you can practice your child's handwriting skills using the writing worksheets below. The third printout has three rows of pictures. 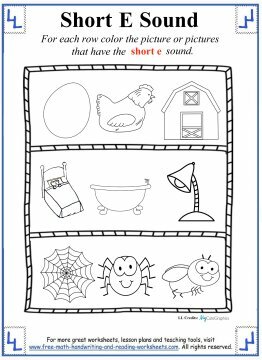 For each row, you need to have your child name the items and then color the ones that use the short vowel e.
In the next activity, there are three rows. Each row has a picture with a set of four words next to it. Students will need to identify the pictures, circle the correct word in each row, and then write it on the line provided. Then you'll see an activity sheet with nine pictures on it. Name each picture and if the word uses the short vowel sound of e, write the letter e on the line. For older students, you may want to have them write the entire word. Or, you could spell it for younger students and have them write the whole word as well. The final paper shows clouds with words in them. 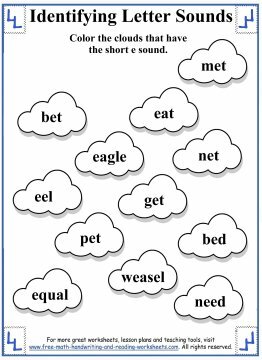 Color each cloud that uses the short vowel e.